You know those Sundays come around-winter weather moves into your area-and your church does not cancel services. Most people will stay home, but you need to be there, and be prepared for the children whose families will make it in to church that morning. After a hideous winter last year with several Sundays like that, I decided to put together a Snowy Sunday Rescue Kit. No more scrambling in the Resource Room. Here’s what I put in mine, and I’m sure your ideas will be even better! I start with the Bible Story and the Memory verse. After that, everything has a snow theme. 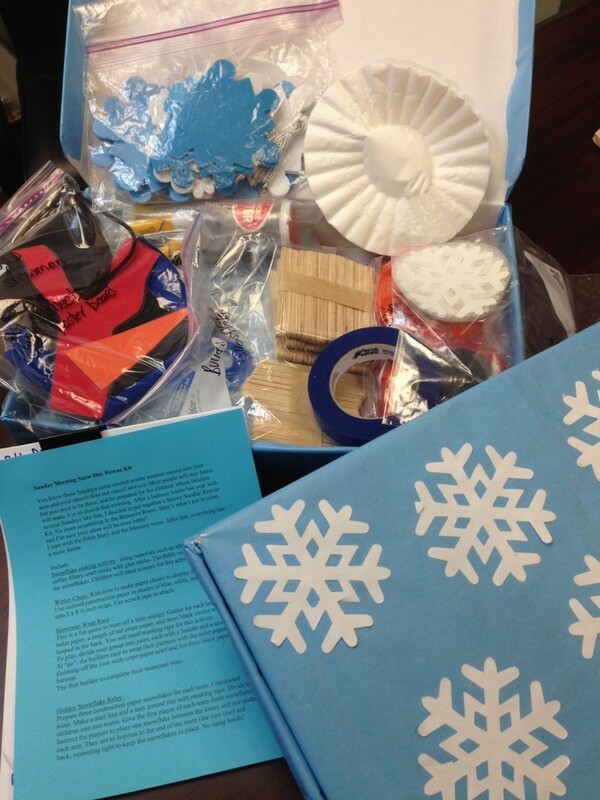 Snowflake making activity: using materials such as white copy paper , coffee filters, craft sticks with glue sticks. The Bible verse can be added to the snowflakes. This is a fun game to burn off a little energy. Gather for each team: a roll of toilet paper, a length of red crepe paper, and three black circles with tape looped in the back. To play, divide your group into pairs, each with a builder and a model. At “go”, the builders race to wrap their partners with the toilet paper tissue, finishing off the look with crepe paper scarf and the three black paper buttons. The first builder to complete their snowman wins. Prepare three construction paper snowflakes for each team. I laminated mine. Make a start line and a turnaround line with masking tape. Divide the children into two teams. Give the first player of each team three snowflakes. Instruct the players to place one snowflake between the knees and one under each arm. They are to hop/run to the end of the room (the turn line) and back, squeezing tight to keep the snowflakes in place. No using hands! Then they pass the snowflakes to the next player inline. If a player drops a snowflake, he or she must return to the start line, replace the snowflakes, and hop again. The object is to see which team can build a snowman first. For each team you will need a set of construction paper snowman pieces (hat, eyes, nose, buttons, scarf, arms) and a poster board snowman. When a child answers the question correctly, they get to add a piece to their snowman. Prepare the Snow Holder Tube by taking a plastic canvas from the embroidery department, and securing it into a tube using four twisty ties. Gather pom-poms and wooden skewers. Stick the skewers randomly through the tube. Fill tube with pom-poms. To play: ask a review question. If the kid gets it right, they can remove a skewer trying not to let any pom-poms fall. Continue playing until someone causes an avalanche. Provide each child a sheet of light blue construction paper. Ask them to write on their paper what they like to do in the snow. They can decorate their paper by making snow designs with glue dots, sprinkled with glitter. Have the kids write each book of the Bible on white copy paper and wad them up to make snowballs. Divide into two teams. Each team takes half the snowballs to opposite sides of the room, with a tape line dividing the two sides. On “go” the snowball fight begins. After all snowballs have been thrown, count to see how many snowballs are on each side. Then have kids un-wad each paper, and put the books of the Bible in order.